Concerning “teeth,” my opinion is that the projections from the edge of the petals and/or sepals that are basically triangular in shape with the base of the triangle being along the outer edge of the petal/sepal if there were no projection from that edge and the two sides of the triangle meeting at a “point.” That is rather cumbersome in words, so I’ll try to illustrate it. 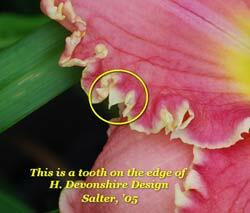 The picture file “Tooth-Dev-Des” shows a single tooth on a petal of H. Devonshire Design (Salter, 2005). The triangular shape is easy to see. A question would be, how well distributed around the edge of a daylily for that flower to be noted as having teeth? The second picture (P C-1) is a second-blooming-year seedling of mine. Near the throat there are many yellow-gold teeth (according to my definition). However, and here is another problem, from half-way up the petal to the tip of the petal, there are protrusions from the edge that are not teeth according to my definition. In fact, I observe two more different types of edge growth – - small knobs (?) liked those on the petal at 2 o’clock and “hooks” as on the petal at 10 o’clock. So, if I should register this seedling, should I say it has teeth, knobs and hooks? And should you buy it, would you get all three when you grow it in Ohio as I do here in the heat of a Georgia summer? Or, should it be registered as having only the type of edge that occurs most often? In this particular case, I’m not so sure which one has the most occurrences! Thanks Larry for sharing your thoughts and images! Tommorow on the daylily teeth blog Roy Woodhall and Mort Morss. 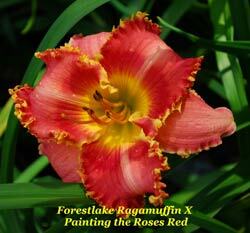 This entry was posted in Daylily Hybridizing, Introductions, Seedlings and tagged teeth definition. Bookmark the permalink.